Ruth Foerg was “thrilled” to receive the $5,000, OMCT administered, bursary for 2015. A day of erratic showers had mellowed to a pleasantly mild evening by the time the small reception of Masons from the four constitutions had gathered at the Dunedin Masonic Centre on February 3rd. The attendees witnessed the 9th presentation of the Port Chalmers’ Marine Lodge bursary, which the Lodge created to assist an exceptional High School leaver from the Port Chalmers region with the costs of their tertiary learning. The grant is given to a young adult who, in the opinion of the committee, has worked hardest - sometimes overcoming considerable adversity - to achieve entrance to a place of further education. 2015’s recipient was a worthy winner. A self-effacing young woman, Ruth Michal Foerg ventured into the Lodge room looking as if she considered herself undeserving of the attention paid to her. She was accompanied by her mother, sister, and boyfriend, all wearing wide smiles that signalled their pride that she had achieved this recognition. For a long-time Ruth has harboured a desire to work in the food industry, but this vast industry requires one to learn and gain great knowledge of its complex mechanisms if one is to ever achieve within any of its multitudinal sectors. 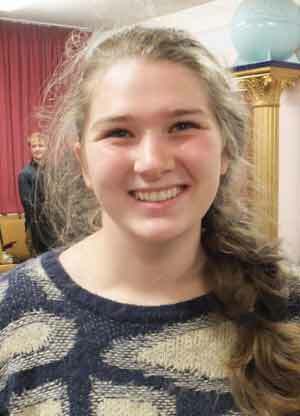 Ruth, however, suffers from dyslexia, a condition that has slowed her progress in education, and it has simply been through her foot-slogging battle, wrestling with her problem, that she finally achieved the NCEA results required to gain entry to Otago Polytechnic. Finally, with a little help from Freemasonry, she is on track toward a Bachelor of Culinary Arts degree. For the past 8-years, the history of the Port Chalmers’ Marine Lodge No. 942 E.C. and the story behind its bursary was explained to recipients by Lodge St. Patrick member, Rt.W.Bro. Gordon Baines but, following his passing, the role this year was fulfilled by Lodge Secretary, V.W.Bro. Mel Darling who was a Mason in the English Constitution prior to his joining Lodge St. Patrick 468. By being swift and precise, Mel did a fine job of making this history, and the ethos of Freemasonry in general, interesting for the young people present. Raewyn suggested that without the assistance of Masonic charity to relieve her burden the financing of her daughters’ further education may well have been beyond her means.